By early 1942 the Japanese Navy had seized the Australian base at Rabaul, New Britain, and troops were pouring ashore in the harbor. A Navy bombing mission was hastily planned to strike at the Rabaul invasion fleet. Nine B-17E's were scrapped together near Townsville, northeast Australia, for a raid taking off at midnight, Feb 22. Two B-1ts collided in the darkness on the runway, and a third was grounded with engine problems. The remaining bombers were soon separated by vicious storms en route, but B-17E #41-2446, piloted by Fred Eaton, eventually arrived over the target. Eaton made a run only to find that his bomb bay doors were stuck. He swung around again for a second pass, making sure that his bombs landed among the Japanese ships. Anti-aircraft fire was intense, and a round punctured his wing fuel tank, draining it. A6M "Zero" and A5M "Claude" fighters swarmed the bomber, and a running fight between the bomber and as many as ten Japanese fighters went on for 35 minutes. The big bomber weaved as Eaton desperately maneuvered it between towering thunderclouds. The fighters were unable to shoot down the Flying Fortress and eventually turned back, frustrated. The B-17 continued on, running for the refueling field at Port Moresby, on the other side of New Guinea. However, with New Guinea's massive Owen Stanley mountain range rising ahead and the B-17s fuel tanking nearing empty, Eaton knew that he would have to put the big bomber down somewhere soon. As they crossed the coast, Eaton perceived a flat green field approximately eight miles inland, suitable for a forced-landing. He feathered the two inboard engines whilst the crew took up crash positions in the radio compartment. The gear-up landing was smooth, and the ship finally came to rest with a slow right-angled turn to the right. A surprise lay in store however. They had put down, not in a flat field, but rather swamp some five feet deep, indiscernible from altitude. The B-17 was left largely intact and undisturbed. The entire crew departed away from the crash site together, and pushed ahead for days. At one point suffering from heat exhaustion and fatigue they considered splitting up, but decided to stay together. Finally, they spotted a native and were taken to his village where they were fed and spent the night. After the crash, Australian Resident Magistrate, Alan Champion at Buna had been told a B-17 went down in his area and was told to search for the crew. Departed from Gona in a mission launch, he searched the area near Oro Bay and the Musa River. Unable to find them, he called into a village and found the crew in their care. The crew of nine were too numerous for his boat and required him to borrow a canoe from the village, to tow everyone back to Buna. B17E #41-2446 was rediscovered in 1972 during an RAAF helicopter exercise in New Guinea. The B-17 was found to be in remarkable condition and fully intact. All interior equipment was pre-WWII US Army Air Corps issue. Even the belted .50 Caliber ammunition were manufactured in 1933, 1935 and an occasional 1938 round. Airframe corrosion was negligible and no damage aside from bent propellers during crash landing, and some broken perspex glass. Several salvage attempts were made during the 1980s and 1990s, and in the meantime the B-17 was given the nickname "The Swamp Ghost" by various articles and visitors to the wreck. The aircraft was finally successfully salvaged in 2006 and will go on display at the Pacific Aviation Museum in Pearl Harbor. 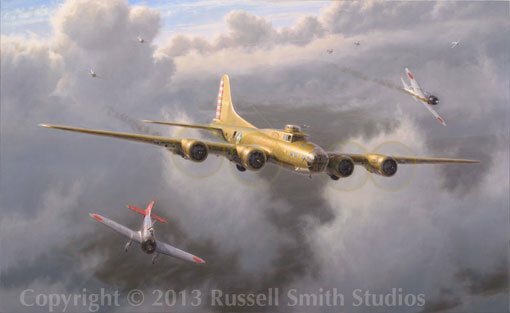 Queens Die Proudly is a depiction of B-17E #41-2446 under attack by Japanese A6M "Zero" and A5M "Claude" fighters as her pilot desperately guides the B-17 away from Rabaul and back towards Port Moresby. The painting was commissioned by the Pacific Aviation Museum at Ford's Island in Pearl Harbor, Hawaii, and will go on display alongside the aircraft as a visual interpretation tool.